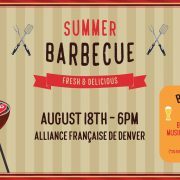 We are excited to co-host a SUMMER BBQ Event with AfD Young Pro’s on August 18th at their backyard location! Members of our EuroCircle pay $15 while non-members pay $20. Please mention that you are a EuroCircle Member at the entrance. Food and alcoholic drinks are INCLUDED! Please RSVP by Monday, August 14th. See you all there! An evening with delicious meats, fresh beers, wine, good music and pétanque. ALL INCLUSIVE for only $15 for members and $20 for non members.